I see that it is Thanksgiving day again in the US, and I caught myself thinking about some lovely things some friends have done for me lately, I realised how thankful I was to have them as friends. That got me thinking – a moment away from thinking about all things Christmas! – and so I had a little play. You will no doubt have seen the triangle boxes around the internet many times, but I decided to have a go with making mine from our Vellum Cardstock. The heavier weight of it handles the heat from the heat tool well when embossing so it really lets you add a lovely touch. My original plan was to go with white embossing, but I’ve never embossed with gold on the vellum. Can I say I’ve impressed myself??! I love the look – totally elegant! A little box like this is great for little thank-yous for teachers, or as favour boxes for the Christmas functions – or as a way of simply saying thanks to someone special. The box can be made to any size you like to fit almost any gift you could think of. If you haven’t already got instructions for it, email me and I’ll be happy to send some your way. Because my box is so small (just 3 inches “tall”) , I’ve used the swirl from the Season of Joy set. It works well with the proportions of the box. 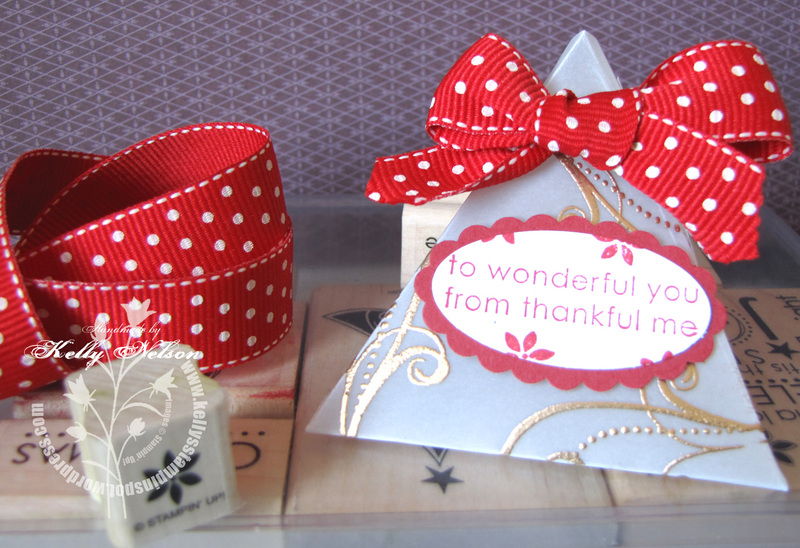 The sentiment is from Sweet Little Sentiments, a level 1 Hostess set. It looked a little lonesome on the tag, so I paired it with the teeny-tiny poinsettia stamp from Season of Joy and again, impressed myself with how a little extra finished things off nicely. The Riding Hood Red mat has been punched with one of our most popular punches – the scallop Oval from the Spring Mini. Don’t forget that the Spring Mini finishes as of 30 November. Have you purchased all that you want from it? Thing like the gorgeous corduroy buttons, the super wide, striped ribbon and the wonderful Ski-slope DSP will all disappear once we get to 30 November. Likewise the Scallop Oval – as much as we love it, there is no guarantee it will make it into the main Idea Book and Catalogue in 2010. Don’t be disappointed by missing out on your favourite items – I’ll be placing a final November order on the 29th. Make sure you have your order with me by then. And speaking of finishing…… did you see the bow I’ve finished with ? That’s a little sneak peek into what is coming up in the Summer Mini. It’s red, with spots or not…. and it is simply GORGEOUS! ← Now where in the world did she get to?? ?